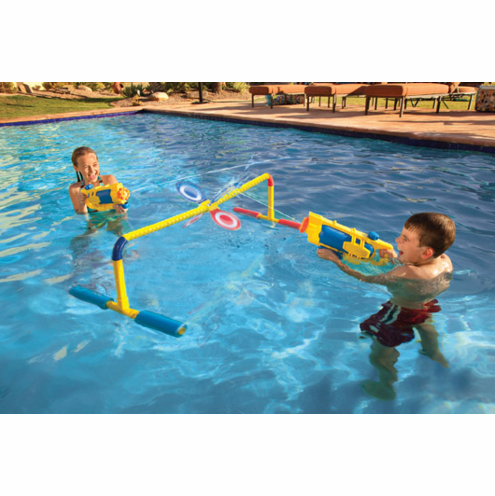 Home | Pool and Patio Accessories | Pool Toys, Games and Beach Balls | Water Wars by G.A.M.E. Home | Pool and Patio Accessories | Pool Toys Games Floats and Masks | Pool Toys, Games and Beach Balls | Water Wars by G.A.M.E. Grab your water guns and have a dual of water wars. This floating target game provides challenging fun. Pick a color and aim at the center of your target. The targets will spin to the left and right. Keep shooting until the target reaches the end of the pole to win. Play one against one or in teams.